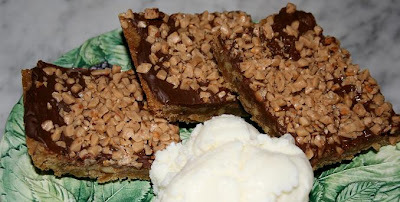 I was excited when I found out that this week we were making caramel crunch bars-not too much chocolate and no eggs in the recipe. The bars are very easy to make, and are done after less than 25 minutes of baking. The only substitution I made was that I used walnuts in the crust instead of chocolate. I'll always choose nuts over chocolate given half a chance. I served them wih some homemade vanilla frozen yogurt-a rather tart version. The caramel crunch bars are really good, Dave ate about 5 of them before I even had a chance to take a photo. You can read about Tuesdays With Dorie here:http://tuesdayswithdorie.wordpress.com/. The blogger who hosted this weeks recipe is Whitney at What's Left on the Table. Please check out her blog! You can find the recipe for the bars there. Thank you farah! I appreciate your comments!